A 3/4 concert guitar with a laminated cedar top and frames and back made of laminated mahogany for children from approx. 8 years of age. 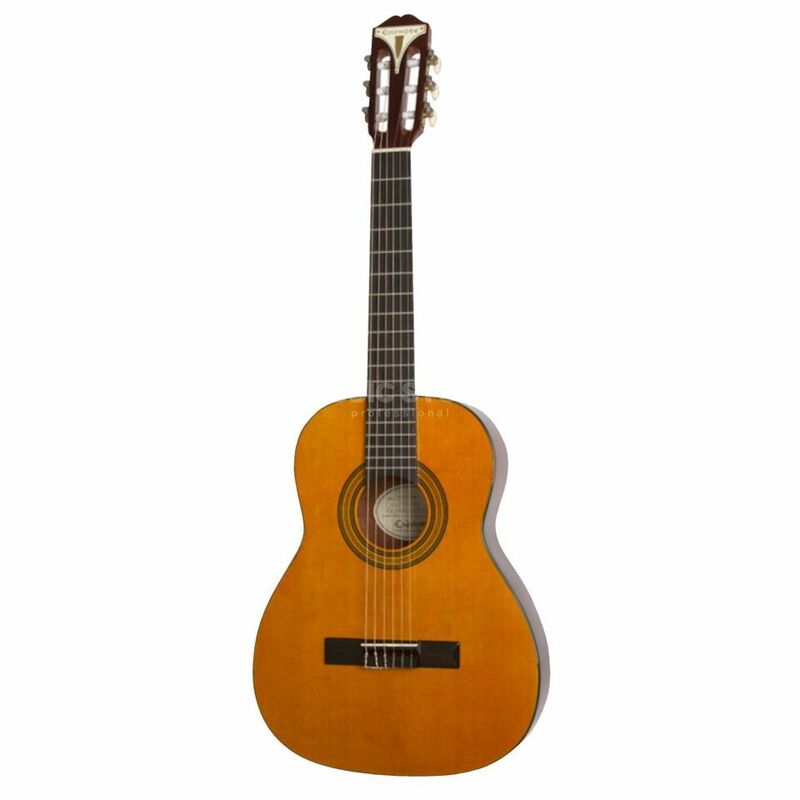 The Epiphone PRO-1 Classic 3/4 Size Classical Guitar Natural is a 6-string classical guitar featuring a cedar top, a mahogany body and neck, a rosewood fretboard, chrome hardware and a natural finish. The PRO-1 Classic 3/4 Size produces a balanced sound and PRO features, enabling any player to discover their own style. The PRO-1 Classic has a laminated cedar top with beautiful 4-layer black and ivory binding. Equipped with Epiphone's JumboPRO frets, holding notes and chords down is now much easier, as they are taller and wider than smaller frets. In addition, the EZ-Profile neck is designed so your hand can easily form chords without feeling fatigued. The PRO-1’s scale length is shorter than most acoustic guitars, meaning the strings are under less tension so you don’t have to press hard to get a quality tone. The PRO-Ease string and fingerboard coating provides sleek, smooth action with reduced string noise. With Epiphone’s Dual-Action truss rod, you can adjust the neck in both directions, which stabilises the neck and makes set-up easier and more precise.